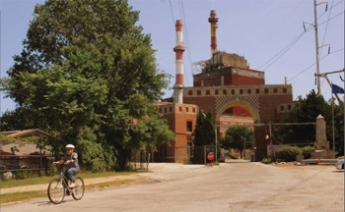 Chicago's power plants, like this State Line Generation Station across the border in Hammond, Ind., are believed to affect the health of people who live closest to them. In Chicago, most of those people are Latino. Photo by Robert Thornton. This is the third installment in a three-part series for Chicago Matters: Growing Forward. This year’s Chicago Matters–the award-winning multimedia public affairs series made possible by The Chicago Community Trust with programming from WTTW 11, Chicago Public Radio, the Chicago Public Library, and The Chicago Reporter–will examine how the choices we make today impact our environment and the future of our region. For more information, visit www.chicagomatters.org. From the friendly confines of Dvorak Park in Pilsen, Maria Chavez hopped on her bike and rode along the weedy sidewalks across busy Cermak Avenue just to marvel at the jet black piles of coal stacked outside the Fisk coal-burning power plant. The coal was stacked alongside a boxy, red brick building puffing dirty smoke from a tall smokestack with blinking red lights on top. She enjoyed the solitude and the strange sight of the coal next to the murky waters of the Chicago Sanitary and Ship Canal. No one ever talked about what went on there. But even as a kid, Chavez was concerned. In the mid-1990s, in her 30s and still living nearby with a young daughter, Chavez called the Illinois Environmental Protection Agency with questions and to complain about emissions from the smokestacks. Various people she was transferred to said they’d take a message or get back to her. But no one did. In 2004, a grassroots environmental group formed–” the Pilsen Environmental Rights and Reform Organization, or PERRO. Chavez, now 43, began doing research with the group and confirmed her fears: Archaic coal-burning power plants like Fisk, owned by Midwest Generation, are believed to be responsible for causing or exacerbating asthma attacks and other respiratory problems in local residents. By burning coal, companies produce energy for homes throughout the region. But these toxic plants were often built in rural areas where they couldn’t impact the health of nearby residents. When Fisk was built in 1903 it was on the outskirts of the city, but Chicago has since expanded. There are now six operational coal-burning plants in the Chicago area. Fisk and Crawford are five miles apart and within the Chicago city limits. There are also plants in Joliet, Waukegan, Romeoville and just across the border in Hammond, Ind. Despite national efforts to curb toxic emissions from coal plants through legislation and oversight, these plants continue to operate with impunity. All six were built in the first half of the past century and therefore grandfathered in under the Clean Air Act. That means they don’t have to meet the harsher standards newer facilities have. Officials at Dominion, which owns the Indiana facility, did not follow up on interview requests. But in 2007, the Hammond, Ind., facility was among the nation’s 50 worst emitters of mercury and nitrogen oxide in proportion to energy output, according to a report by the Environmental Integrity Project. Midwest Generation’s five Chicago area plants did not make that list, but have been cited by the EPA for violating opacity regulations for more than 500 hours. Local and state officials have led several efforts to force companies–”particularly Midwest Generation, which owns five of the six area plants–”to clean up their act. But many attempts have failed. The plants continue to have poor emissions and are believed to produce higher rates of respiratory problems–” asthma, bronchitis, and in some cases premature death for the people living near them. In Chicago, the vast majority of people living within a half-mile radius of the two coal plants are Latino: nearly 95 percent in Little Village and 85 percent in Pilsen, according to 2000 Census data. The region that includes those plants, as well as the area around the Indiana facility, have significantly higher rates of asthma and bronchitis than the northern and western regions in Cook County, where there are no coal-burning plants, according to Cook County Department of Public Health data. However, there are multiple other sources of air pollution in south and southwest metropolitan Chicago that could also be to blame for these health effects. Chicago Department of Public Health spokesman Tim Hadac said that asthma rates for Pilsen and Little Village are lower than citywide averages. “That’s quite different than what we’d expect, given the claims of the activists,” said Hadac. However, it’s possible city health statistics may be underreported, said PERRO activist Dorian Breuer and other immigrants rights advocates, influenced by the fact that many immigrants don’t seek medical care if they are undocumented or don’t have health insurance. Staff at the Alivio Medical Center in Pilsen say they see many such cases. In their conversations with neighborhood residents, PERRO members also heard many tales of children with asthma and chronic respiratory problems. The power plants are “significant emitters of pollution in the Chicago metropolitan area,” said Matthew Dunn, chief environmental enforcement/ asbestos litigation division for the office of Illinois Attorney General Lisa Madigan. The three suburban plants are also located in areas with significant Latino populations, especially Waukegan, which is 44 percent Latino. In Joliet and Romeoville, the Latino population is 18 and 13 percent, respectively, which may not appear to be significant. The Will County Station plant in Romeoville is in a census tract that is just 13 percent Latino and 6 percent black. However, more than half, or 55 percent, of Romeoville’s African Americans live in that census tract and half, 50 percent, of the village’s Latinos live there. Public health data shows that people living in South and Southwest suburban Cook County, closer to the Chicago and Northwest Indiana plants, have higher death rates because of lung and heart disease, and higher rates of hospitalization for asthma and bronchitis. In 2005, the south and southwest quadrant had 283 and 205 asthma or bronchitis hospitalizations per 100,000 people, compared with 176 and 122 for the west and north, according to the Reporter’s analysis. In west suburban Will County, where Midwest Generation’s Joliet and Romeoville plants are located, records that break down incidence of disease are not kept, according to county officials. The statistics in the Chicago metro area add to an already documented problem with asthma among minorities. Chicago has some of the worst asthma rates in the nation, according to various sources, including a 1990 study published in the Journal of the American Medical Association. Chicago hospitalizations for asthma are nearly double the national average, according to calculations by the Respiratory Health Association of Metropolitan Chicago. Nationwide, minorities suffer disproportionately from asthma. The Respiratory Health Association of Metropolitan Chicago reports that the death rate for black people and Latinos are “particularly high” and four to six times higher than it is for white people. New coal-burning plants typically employ various types of “clean coal” technology that vastly curb emissions. But across the country there are still hundreds of plants that were built prior to the Clean Air Act of 1970. The idea was that these plants would be decommissioned and replaced by new cleaner plants. But many of them are still around, including all six in the Chicago area. The emissions that pose the most serious health risk are particulate matter, sulfur dioxide, nitrogen oxide and mercury. Particulate matter lodges in the lungs and is known to cause or aggravate respiratory diseases, including asthma and bronchitis, and has also been linked to heart disease and premature death. In the American Lung Association’s “State of the Air: 2008” report released in May, Chicago ranked 13th nationally for short-term particle pollution. While tall stacks mean emissions generally disperse over a relatively large area, depending on wind conditions, particulate matter falls more quickly on the area directly surrounding a power plant. In Chicago, that means the Latino neighborhoods of Pilsen and Little Village. A 2001 study by professors at the Harvard School of Public Health correlated emissions at nine Illinois coal-burning power plants with health data. The study estimated that the plants in Pilsen and Little Village together are responsible for 41 premature deaths, 2,800 asthma attacks and 550 emergency room visits per year. Midwest Generation spokesman Charley Parnell said the study receives too much attention. He said it was not peer-reviewed and that the company has improved its emissions significantly since then. Since buying the plants, he said, the company has cut nitrogen oxide by 50 percent and sulfur dioxide by 30 percent combined at the six plants Midwest Generation owns throughout the state, with continuing upgrades planned. A 2006 agreement between the Illinois state government and Midwest Generation, Ameren and Dynegy, which also have power plants in northern Illinois, mandates further cleanups over the course of a decade. In July, in keeping with the agreement, Parnell said that Midwest Generation installed mercury controls at the Fisk, Crawford and Waukegan plants–”choosing those first because of their proximity to Lake Michigan. Between 2012 and 2018 the company will install technology to control emissions on all its plants. Fisk and Crawford will be last in line for this, with deadlines of 2015 and 2018, since they are the company’s smallest plants. The whole process will cost $3.5 billion, Parnell said. The company may decide to close rather than upgrade Fisk or Crawford, depending on steel and labor costs and other factors. Company officials say they have cut down on emissions, but that installing the latest pollution control technology is too expensive and that they may close plants if they are required to make more changes, thus driving up energy rates for area customers. Closing these plants could lead to rate increases and might endanger Chicago’s ability to depend on reliable power, Parnell said. He scoffs at advocates who say the city doesn’t need the old coal-burning plants and should replace them with renewable sources. Locally, PERRO members have gone door to door talking to residents about Fisk, in Pilsen, and other local sources of pollution and lobbied city and state agencies to crack down on polluters. They have done their own soil testing in Pilsen, held press conferences outside of city offices and leafleted Pilsen, demanding that the Illinois EPA and city government do a better job testing and addressing pollution in the neighborhood. State and federal authorities have tried over the years to get Illinois plants to comply with cleaner air standards, despite opposition from the state’s environmental protection agency and Cook County Board of Commissioners President Todd H. Stroger, who vetoed a provision that would have taxed plants for their emissions. On Sept. 14, 2007, the Illinois Attorney General’s office and an environmental group filed a petition in federal court arguing that Midwest Generation made numerous upgrades at its plants over the years for which it should have sought permits from the Illinois EPA. Since it didn’t, the Attorney General’s office said the Illinois EPA should charge Midwest Generation with violations of a law called New Source Review. New Source Review mandates that when significant upgrades or expansions are made at coal-burning power plants and other sources of emissions built before the Clean Air Act, updated pollution control technology must be installed. In keeping with the law, companies are supposed to apply for permits when they make major repairs or changes. But often they don’t, likely to avoid the possible cost of being forced to install pricey pollution controls. “[Midwest Generation] is not doing everything it is required to do under the Clean Air Act of 1970 to reduce their emissions,” said Dunn. The last time Midwest Generation filed permits for modifications was in 1999, Dunn said. Though the petition doesn’t indicate specifics, he said it’s doubtless Midwest Generation has made upgrades that should have triggered New Source Review. “They routinely modified the plants and increased emissions without obtaining pre-construction permits, and installing the best accessible control technology, in violation of the Clean Air Act,” Dunn said. In July, the 7th Circuit U.S. Court of Appeals said Madigan’s office didn’t establish grounds to challenge the permitting decision. Madigan’s office has gone back to the same court and asked them to reconsider the decision, Dunn said. The U.S. EPA has also charged Midwest Generation with violating New Source Review and opacity limits. In Illinois, power plants can only allow emissions exceeding 30 percent opacity for up to eight minutes during a onehour period. Midwest Generation’s coal plants exceeded that limit by thousands to tens of thousands of minutes between 2002 and 2006, according to the U.S. EPA. Confidential negotiations are occurring between Midwest Generation and the U.S. EPA to resolve the situation, according to George Czerniak, chief of air enforcement and compliance assurance for the U.S. EPA Region 5 air and radiation division. The negotiations could result in a compliance agreement, or the U.S. EPA could file a lawsuit against the company. The complaint also names Commonwealth Edison, which is undergoing separate negotiations with the EPA. Parnell said the violations occurred mostly before the company bought the facilities in 1999. “We’re figuring out where [ComEd’s] liability ends and ours begins,” he said. The nation gets about half its electricity from burning coal. Though coal-burning power plants are a major source of greenhouse gases and emissions that impact public health, coal is still the linchpin of the country’s future energy plan. More than 150 new coal-burning plants have been proposed in recent years, with coal expected to easily outpace natural gas as the hottest energy source by 2021, according to an analysis of government data by the Environmental Integrity Project. No one disputes that current wind and solar power producers have nowhere near the capacity to meet the public’s energy demands. Right now wind, solar and geothermal combined supply only about 3 percent of the nation’s power, compared with 20 percent nuclear, 18 percent natural gas, 7 percent hydroelectric and about 50 percent coal. Chavez feels like it is up to her and other community members to educate people about this health threat right in their own backyard, and demand changes be made to protect their health and the environment. Contributing: Alden K. Loury. Matthew Hendrickson helped research this article.